Real median household income at the end of 2011 is back where it was in 1967–68. Moreover, Williams has deflated household income to get its real value by using the official inflation measure, which substantially understates inflation. 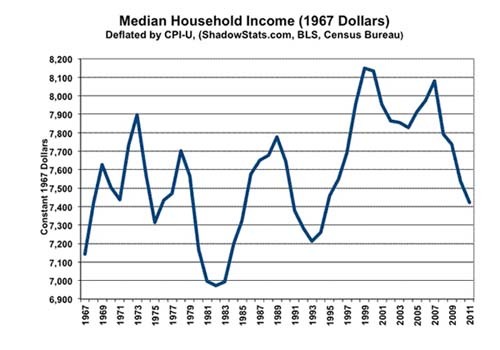 If Williams had used the 1990 or 1980 official government methodology for calculating the consumer price index, the real median incomes of households would show a larger decline. Moreover, the low 2011 real median household income is the summation, in most cases, of two household earners, whereas in 1967–68 one earner could produce the same real income. As Nobel economist Gary Becker, my former colleague and Business Week columnist, pointed out, when both husband and wife have to work in order to maintain the same purchasing power, household income from the wife’s in-kind household services is eliminated. Therefore, the monetary measure of the dual household income overstates income, because it is not adjusted for the lost benefits formerly provided by the wife who at home managed the household. But how do you sell houses to households who are getting by with 1967–68 levels of real income and who have absolutely no job security? Their company can be taken over and offshored tomorrow or they can be replaced by foreign workers on H-1B visas. Housing prices have dropped, but not to 1967–68 levels. 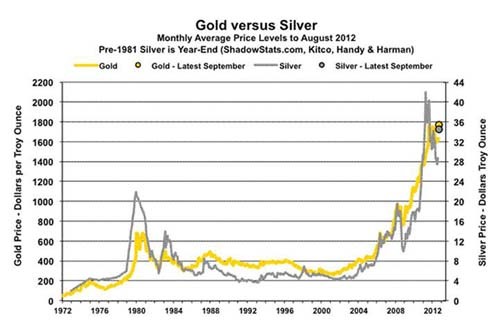 The bubble has been protected by the euro “crisis,” which possibly is more of a virtual crisis than a real one. The euro crisis has caused money to seek refuge in dollars, thus supporting the dollar’s value even while the Federal Reserve prints money with which to purchase the never-ending flow of the governments’ bonds to finance trillion dollar plus annual budget deficits—about 5 times the “Reagan deficits” that Wall Street alleged would wreck the US economy. What if instead of taking the bait from Washington, China targets Washington’s Archilles heel—the dollar’s role as reserve currency—and decides it is cheaper to dump one trillion dollars of US Treasury debt on the bond market than to commit to a 30-year arms race? To keep the price of Treasuries from collapsing, the Federal Reserve could print the money to buy the bonds. But if China then dumps the printed one trillion dollars in the foreign exchange markets, Washington cannot print euros, British pounds, Russian rubles, Swiss francs, and other currencies in order to buy up the dollars.